Ruth (Campbell) Travis, 89, of Hendersonville passed away Sunday May 6th at the Gallatin Center for Rehabilitation and Healing. Ruth was born September 20, 1928 in Todd County, KY to the late Theo F. and Alice Belle (Perkins) Campbell. While a high school student she met the man who was to become her loving husband of more than 65 years, Coleman L. Travis. They were married on Christmas Day, 1952. Following high school she attended the Lois Glenn Beauty School in Bowling Green, KY and she worked as a hairdresser for ten years. She later began a career in retail at Castner-Knott and through various rebrandings and acquisitions saw her retire from Macy’s after 29 years in the industry. She and her husband moved to Tennessee in the 1950’s and settled in Hendersonville in 1961. She was a devoted wife, mother and grandmother. Ruth loved to talk and was truly one of a kind. She also enjoyed collecting antiques, particularly dolls. When she had an opportunity she loved to go on outings with her dear friend Joy. 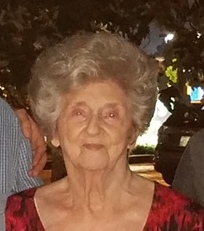 Ruth leaves to cherish her memory, her husband, Coleman L. Travis; her daughter, Daphne Hutchison; her son, Coleman L. Travis II and his wife Kim; her grandchildren, Bond Hutchison, Cole Johnson, Sarah Travis and Rachel Travis; her brother, Frank “Sonny” Campbell and his wife Anna Marie Campbell as well as extended family members and friends. Visitation for Ruth will be held Saturday, May 12th from 11 AM to 12:30 PM at Cole & Garrett Funeral Home, Goodlettsville. A life celebration service will be held at the funeral home Saturday at 12:30 followed by entombment at Forest Lawn Cemetery. Ruth was truly one of a kind. I enjoyed a few visits with her and a few telephone conversations the past few years. She worked with my Aunt Dorothy Payne in Trenton, KY at Dorothy’s Beauty Shop in the ’50s. My aunt enjoyed Ruth’s friendship for many years. They both told me stories of working in the beauty shop together and living in Trenton. My Uncle Bob Payne and Aunt Dot always spoke fondly of Ruth. May all that made Ruth who she was forever be a blessing in her families lives. She was a treasure.